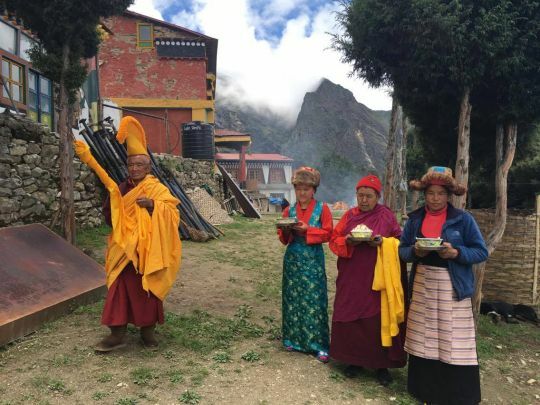 Lama Zopa Rinpoche’s uncle, sister, and others welcoming the large Guru Rinpoche statues to Lawudo. 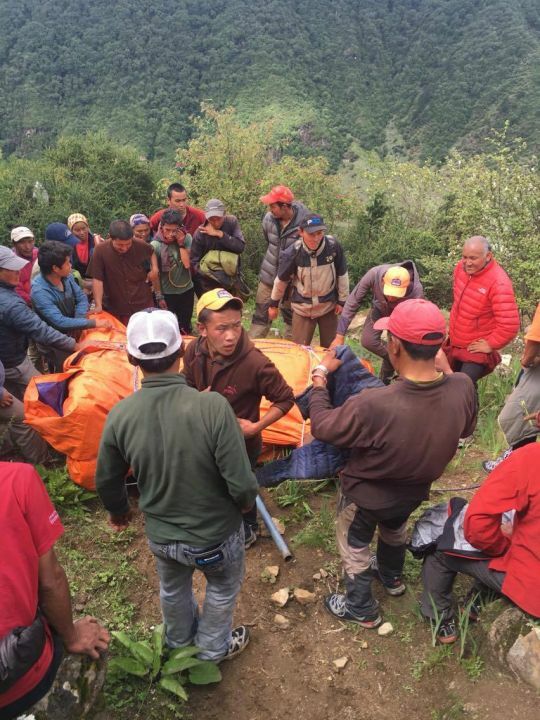 This 13.5-foot-tall Guru Rinpoche statue had to be airlifted to Lawudo. Lawudo Retreat Centre is situated in the highest area of Solu Khumbu (altitude of 13,000 feet) , the northeastern region of Nepal bordering Upper Tsang in Southern Tibet. Getting a human body up to Lawudo is no simple matter. The quickest and (relatively) easiest way is to fly from Kathmandu to Lukla and then walk for two days from Lukla to Namche Bazaar. Lawudo is a further 4-5 hours walk up a very steep path from Namche Bazaar. The other way is to first travel by bus from Kathmandu to Jiri which takes ten hours. The trek from Jiri to Namche Bazaar takes nine days. 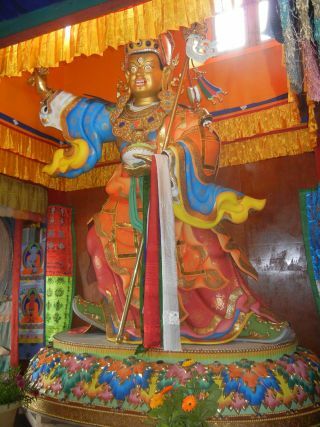 What about getting eleven large Guru Rinpoche statues—one 13.5-foot-tall and the others over 2-foot-tall—up to Lawudo? Amazingly, this was accomplished and it was no simple matter! The large statue had to be airlifted (by the largest helicopter in Nepal) but there were delays due to bad weather. A special permit was required to even operate this immense aircraft. A test flight had to be arranged before the run with the large statue could be initiated to make sure the mission would be successful. After twelve days of delays due to bad weather the large statue was finally airlifted to Lawudo in good condition. The smaller statues will be airlifted in the same way. 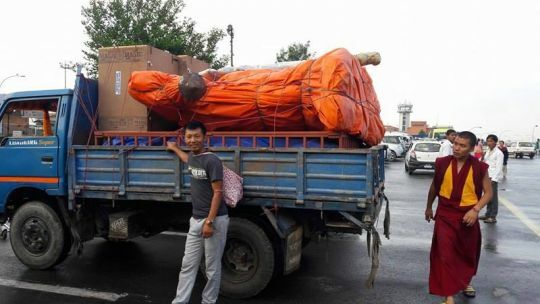 Large Guru Rinpoche statue being transported to Lawudo. The Guru Rinpoche statue making the trek up to Lawudo.